Malaga Island is a 41-acre (170,000 m2) island at the mouth of the New Meadows River in Casco Bay, Maine. It was the site of an interracial community from the Civil War until 1911, when the residents were forcibly evicted from the island. It is now an uninhabited reserve owned and managed by the Maine Coast Heritage Trust. Public daytime access is permitted. The Casco Bay Breeze and other newspapers nosed around in the 1890s, then printed stories about a "degenerate colony," whose indiscretions included use of tobacco and of tea. The towns of Phippsburg and Harpswell fought not to take control over the settlement, but to build a hotel for business, and in 1905 the State of Maine took responsibility for this poor island community that nobody wanted. The state built a school and furnished a schoolteacher and began focusing its attention on the unorthodox community. While some saw improvement in the island, Governor Frederick W. Plaisted saw blight on his state’s reputation. 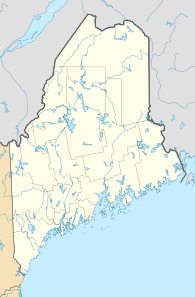 Under the Governor's direction, Maine's authorities abducted and removed men, women, and children many of whom were forced into various institutions and, in 1912, undertook the mass eviction of the remaining 45-member interracial community. To discourage resettlement, Maine authorities eventually even dug up the graves, and took the dead for burial at the Maine School for the Feeble-Minded in Pownal. On April 7, 2010, Maine legislators finally issued an official statement of regret for the Malaga incident, but did so without notifying descendants and other stakeholders either before or after the fact. The "public" apology didn't become known to the public until nearly four months later, when an article appeared in a monthly magazine, Down East, which also procured a statement of regret by Governor John Baldacci. In 2012, a retrospective exhibit at the Maine State Museum was opened, by governor Paul LePage. ^ "Malaga Island". Geographic Names Information System. United States Geological Survey. Retrieved 2008-08-03. ^ "Malaga Island in Phippsburg". Christian Science Monitor. 1911-04-14. Attorney General Pattangall reported yesterday that in his opinion Malaga island in the New Meadows river is owned by the heirs of Eli Perry and that the island is in the town of Phippsburg. ^ Grieco, Jan (October 2004). "Shudder Island". Portland Magazine. ^ a b Dubrule, Deborah (August 2005). "Malaga, revisited: On a Casco Bay island, a shameful incident in Maine's history comes to light". Working Waterfront. ^ Colin Woodard (August 2010). "A Quiet Apology". Down East. ^ Woodard, Colin (May 20, 2012). "Malaga Island: A century of shame". Portland Press HErald. Retrieved 2 January 2013. Malaga Island: A Story Best Untold (WMPG radio documentary onlinewith photos) Click on the Audio tab to listen to the entire documentary. "Malaga Island, Fragmented Lives". Maine State Museum. Retrieved 2 January 2013. "The Evictions of Malaga Island". C-SPAN Local Content. Sep 10, 2012. Retrieved 2 January 2013.